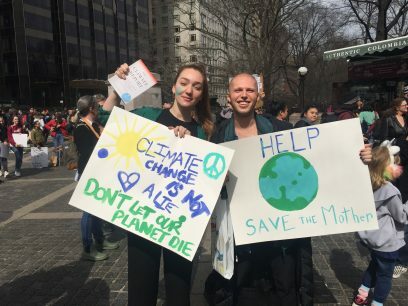 Last Friday, two Melvillians got to take part in history at a Youth Climate Strike in NYC. 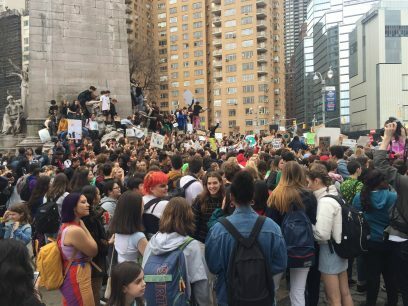 Last week’s Strike was part of an international effort led by teens to encourage world leaders to prioritize the climate crisis. Not only do the strikes have an amazing mission, but they also have an exceptional group of youth leaders organizing the events. Greta continues to strike every Friday and has inspired students around the world to do the same. The movement has been given the hashtag #FridaysForFuture. 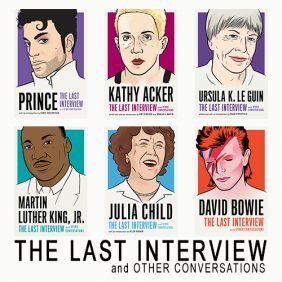 All of us at Melville House were eager to support the mission of the students, as it shared a similar mission to The Melville House Climate Project, so we decided to attend a few NYC strikes and hand out free copies of The Climate Report. We were thrilled to hear that many of the strikers were already educated on the topic of climate change and were still excited to learn more. The energy at the Washington Square Park and Columbus Circle strikes was truly moving and left us feeling encouraged about the future of the earth. Don’t let the movement end here! Stay involved and continue to support these amazing students.